Last year we blogged about design at Fastly, the overarching goal of which is to give you an intuitive and elegant interface to manage your Fastly configuration. This responsibility doesn’t fall solely the on the product design team; everyone at Fastly is counted on to shape the user experience by understanding your needs and expectations and listening to your feedback. In this post, we’ll highlight the latest additions to the Fastly control panel, which offer better overviews and easier ways to customize your VCL. Custom VCL unlocks the full power of our network, but deploying code used to be a cumbersome process in the web interface: you had to download — then edit — a file in your text editor, save it, and then upload it. We’ve made that workflow more direct, so you can view and edit your Custom VCL inline on one screen. The editor highlights the VCL syntax and automatically completes brackets. Frequently when customizing your VCL, you’d simply want to insert a few short lines of code. To do this previously, you’d need to use a large boilerplate template, which was sometimes prone to copy/paste errors. Now, taking advantage of VCL-only features is easier with VCL snippets, which are blocks of logic that are inserted into your configuration where you choose. Snippets let you separate configuration to discrete files, so they are more manageable and easier to share with your team. Our customers were often looking for a high-level view of what they have set up on Fastly: a starting point that would let you quickly navigate to the service you care most about. 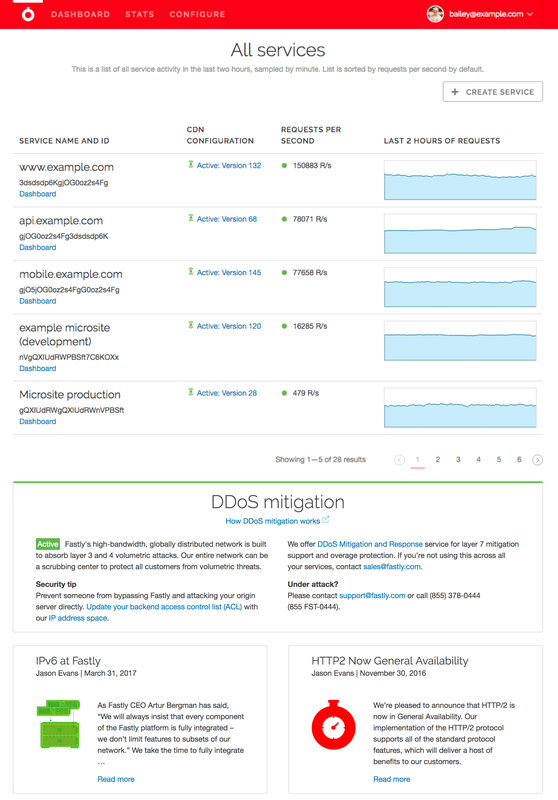 Our new and improved all services homepage now includes the service name and ID, the active configuration version, and graphs showing the requests per second. We’ve also included links to our latest product announcements and blog posts you might find interesting. It’s now the first page you see when you log in! We also wanted to offer a more granular way to view your requests across the globe. The global traffic POP map now expands to show a table of per-POP traffic, so both customers and Fastly support engineers can see where traffic is going and debug issues more easily. With increased visibility into where your traffic is coming from, it’s easier to spot anomalous patterns. We’ve also made it possible for you to see how your Origin Shield is absorbing traffic in real time by putting an indicator beside your shield POPs. 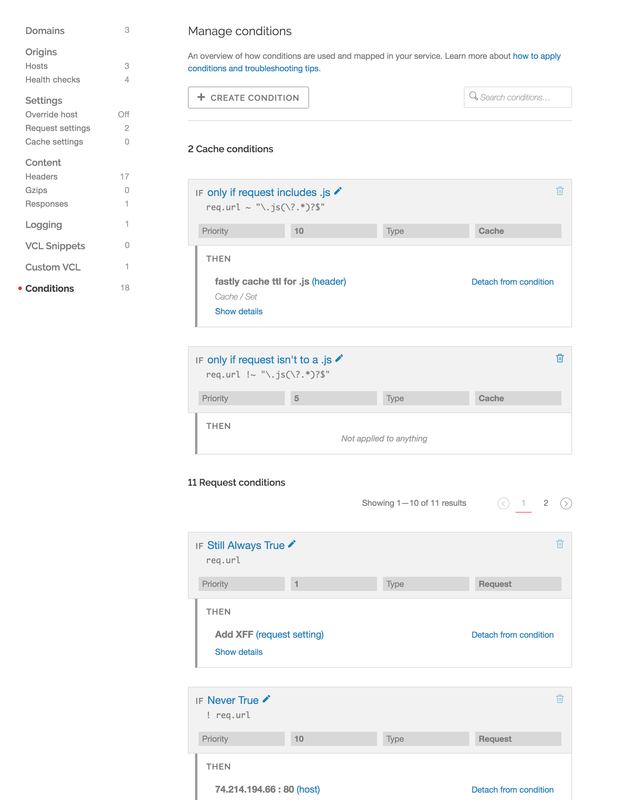 Conditions control how requests are processed; you can use them to apply complex logic to subsets of requests. With our latest updates, you can now view and manage your conditions in one place via the control panel, easily finding (and deleting) unattached conditions. This not only keeps things tidy, but empowers you to keep track of the conditions you care most about. We recently announced our batch API for surrogate key purging, which makes purging content event more efficient by allowing you to purge multiple surrogate keys at once. You can access this feature in our web interface as well as our API — simply “Purge key” from the Purge menu, add as many keys as you’d like to purge (space separated), and it will purge multiple surrogate keys in one batch request. Customer feedback is extremely valuable to everything we build at Fastly — sharing your opinions and experiences is an excellent way for us to learn, and helps us make better design decisions in the future. We’re always looking for ways in which we can help make your experience with the Fastly control panel easier and more intuitive — feel free to submit feedback on the above new features (or anything else) to design@fastly.com. We can’t wait to hear what you think! Jessica is a Product Designer at Fastly. Previously at Twitter and Engine Yard, she enjoys houseplants, pigeons, and playing with the office hay bale (aka Yossy the dog). Brian is a Product Designer at Fastly. Previously at C.H. Robinson, he is a life-long Cubs fan, and loves hot dogs and anchovies (though perhaps not together).